Doing daily activities especially outdoors makes our hair sometimes limp and smelly. At that time all we want to do is go home then wash our hair and hit the shower. Most people use shampoo to wash their hair to make their hair cleaner and smell good. People also try to find a shampoo which can overcome their hair problem. Living in a tropical country make our hair problem slightly different with the other people, in this survey, we find three most common hair problem which is: dandruff, fall hair, and dry hair. We then use these three hair problems as the basic aspect to make the segmentation regarding shampoo consuming behavior by outlining several aspects. This survey is sent to our 2.916 panels in nationwide. 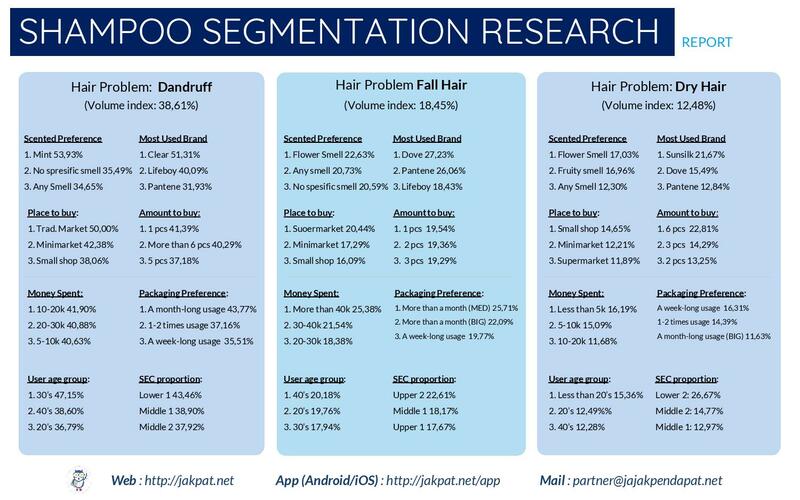 Overall, we can see that respondents with a different hair problem have different consumer behavior as well. We can see that their behavior like the preference of shampoo brand, the place to buy, money spent, amount purchased and so on differ on each hair problem. This entry was posted in Health, Lifestyle on January 17, 2018 by Fauziah Khoiriyani.